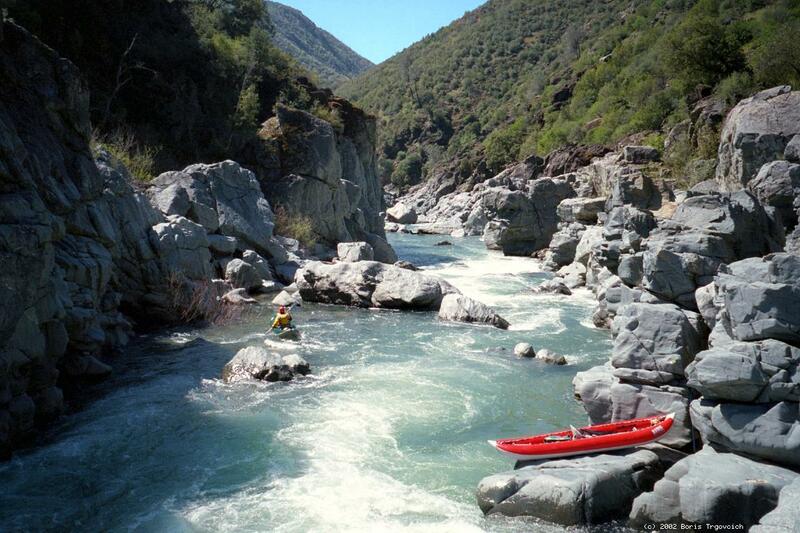 Of the approximately 100 different rivers and creeks I rafted or kayaked, this is one of the finest scenic whitewater runs I have done. Some of it is comparable to the Rubicon and upper Deer Creek, but with much simpler shuttle logistics. With an exception of the first portage, the first mile was relatively easy compared to the 120 ft/mile stretch near the end of the run. This latter stretch includes many rapids that appeared more difficult than the relatively moderate gradient would indicate. 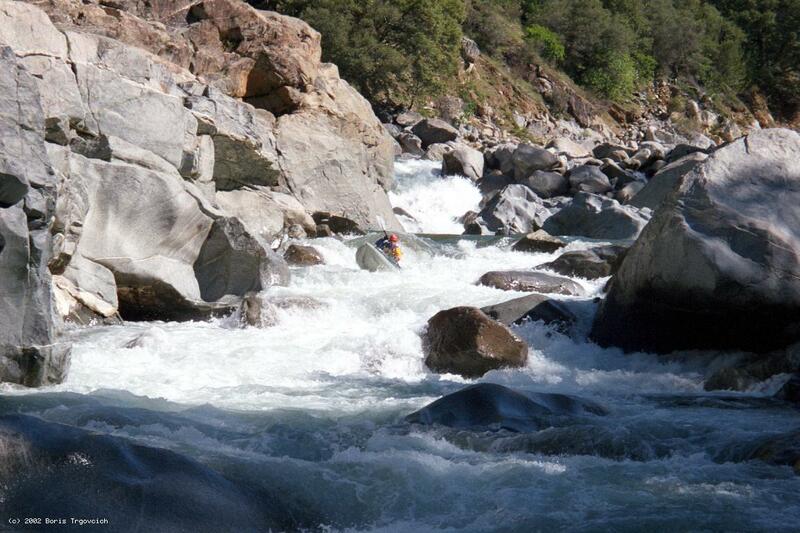 Even at a flow of 525 cfs some of the hydraulics are amazingly powerful and should be carefully scouted. 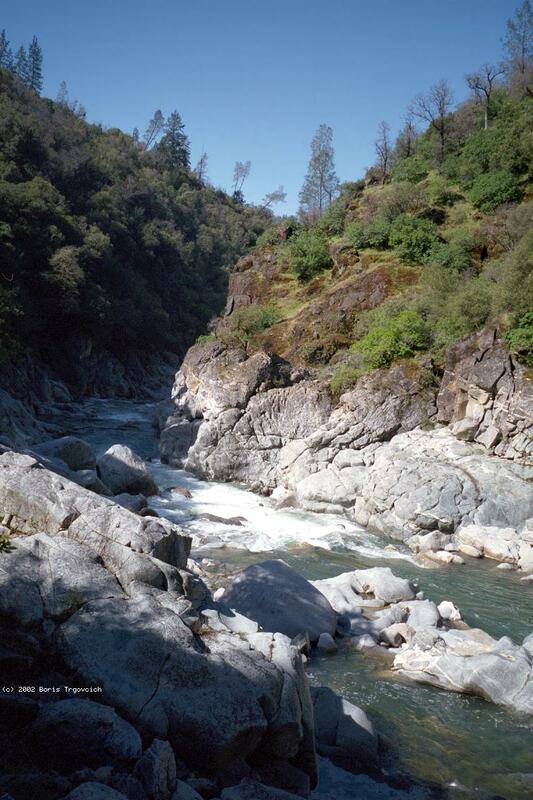 At higher flows the recovery pools below the major rapids would be very short. 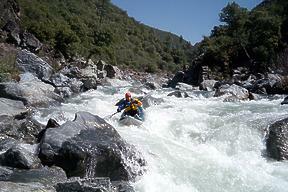 Hard shell kayakers should probably have more options at higher flows recommended by Holbek. After several years of missed opportunities to run this stretch, I finally found someone who was willing to accompany me in an IK. The victim was Jim Bouldin, a neophyte with about four previous IK trips under his belt. 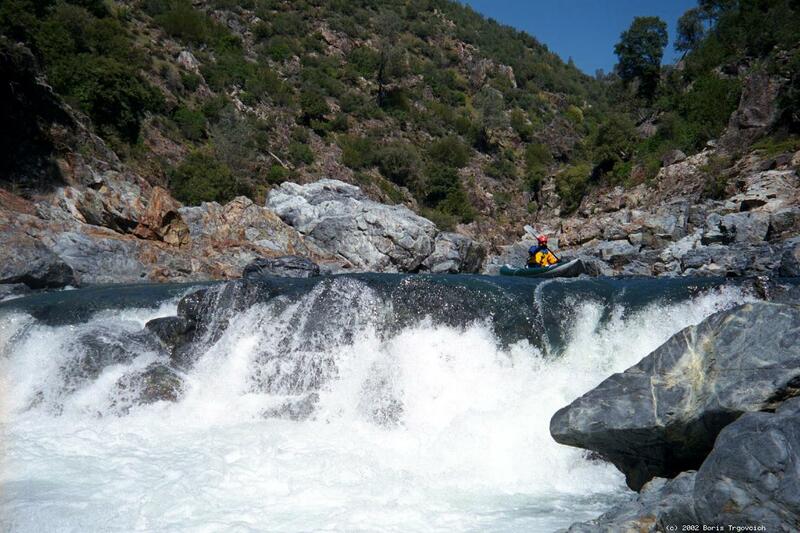 One of these trips was on the Rogue River where we spent a couple of hours running Rainie falls, which involved carrying our boats back upstream after each run. After a combined total of six attempts we managed one successful run between two of us. A graduate student in the process of writing his post-doc research papers, Jim apparently needed some distraction. However he was not totally convinced that this was a good advanced-beginner run. After some less than persuasive arguments I finally convinced him that “Damn the torpedoes, full speed ahead” was the appropriate approach to take and we decided to go for it on a gorgeous spring Sunday. Jim entered the rapid at the same place but attempted to manuever halfway through it and was promptly introduced to the Magic Bus boulder. He disappeared for a few seconds and reappeared again with the shiny side of the boat facing the sky. After a few miles, just as we became comfortable and relaxed, the canyon narrowed again and beyond a long calm pool an ominous sound of falling water announced that we were about to pay for the easy stretch behind us. The river disappeared from sight and we chose to scout on the river left. It turned out to be a “simple” 8-foot drop (although Jim claims it is at least a 10-footer), very similar to Chamberlain Falls on the North Fork of the American, but a little steeper. Here, a large slanted boulder is dividing the flow in two and creating a rather powerful hole on the bottom. At higher flow the entire rock would probably be covered and the drop would be one river-wide waterfall. The left side was very clean and appeared runnable but a flip at the bottom would have probably resulted in some serious recirculation. We decided to line it. As the first boat glided over the drop it got caught in a reversal at the bottom and promptly entered the spin-cycle. We pulled it out and pushed the next one over the drop. It entered the waterfall closer to the center, ski-jumped it and shot well beyond the grip of the reversal. Full perspective of river-wide waterfall Named Two-in-a-Million after One on Rubicon? We continued through several more challenging Class IV rapids before coming to a river-wide 10-foot waterfall. After successfully running it on the far left Jim started lobbying for food and water. Those who boat with me know that, as long as things are going well, I do not like to eat or drink until the end of the day. This reluctance to stop is based on an empirically derived formula (based on my personal experience) that basically equates any type of indulgence in non-adrenalin nourishment and/or relaxation with post-indulgence carnage. However, Jim, a career student, apparently found serious flaws with my formula and presented his own, highly theoretical hypothesis equating energy and hydration with increased physical performance. After sensing that he was beginning to abandon his vegetarian ideals and started acting more like certain members of the Donner party, I agreed to a lunch break. We settled in a beautiful narrow, rust-stained bedrock gorge where the river slowed down to a crawl. After a marathon lunch break we proceeded downstream. Immediately below the lunch spot we observed on the river left a nice cabin and a gazebo-like structure overlooking the river. A road led down to the house. After a couple of easy rapids we came to a rapid with no obvious entrance, however, a quick scouting revealed several easy passages leading into a long class III slalom. I entered one of the slots and instantly found myself wrapped on top of barely submerged rock. After a few seconds meditation, I peeled my IK off the rock but somehow managed to flip it in the process and at the same time get my foot caught in the thigh strap. I quickly worked my way on top of the boat and started negotiating the rest of the rapid sitting on top of my overturned IK with Jim in hot pursuit. Near the end of the rapid the left blade of my Lightning paddle suddenly disappeared, never to be seen again. Using all my C-1 skills I never had, I made it to the shore just before the next rapid, and pulled out a short bent Carlisle spare that I had been carrying around with me during the past several years, but never had an opportunity to use. After a few “I told you so!” and “I knew something like this would happen after the lunch,” we continued downstream. Shortly afterwards Jim flipped at some no-name class II. Still little dispirited and pissed off about breaking a $250 paddle, I again reminded him of the validity of my empirical formula and we continued downstream. I proceeded to the next rapid, which turned out to be an easy Class III, and ran it before realizing that Jim was still far behind me disgorging some of the river from his stomach. I hiked back upstream and after some effort to communicate across the river via hand signals I began to comprehend that what he was trying to tell me would probably be censored even on the Internet. 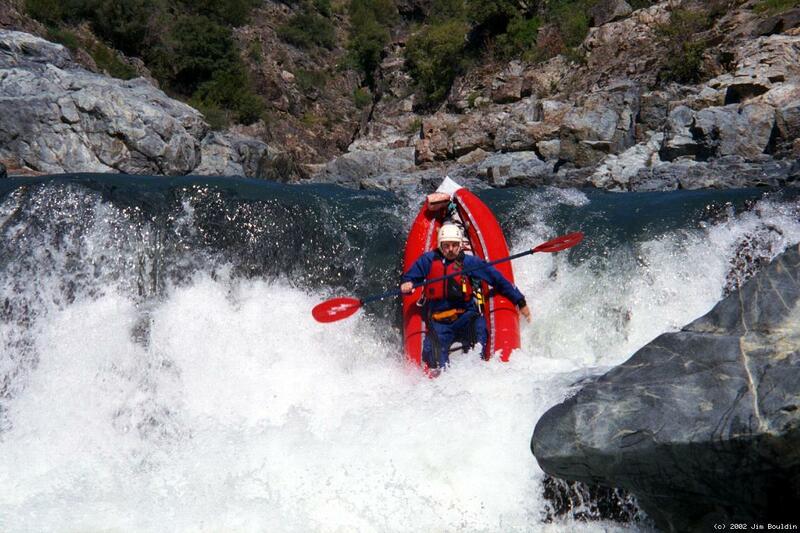 I translated his last hand signal as “Get the hell away from me.” Taking that subtle hint, I proceeded downstream. Not seeing Jim behind me, I hiked back again and found him perched on a rock in the middle of the river rifling through his dry bag. After convincing him that he would be better off looking for his snacks on the shore, I realized that his supposedly waterproof Watershed bag apparently did not stand up to the hydraulic pressure during his last swim. The zip-lock apparently popped and enough water got into the bag to damage his SLR camera. Not knowing exactly what was ahead of us or how far we were from the take-out, I started having visions of night boating. I suggested we keep moving, however, Jim had some different ideas that included not wanting to die, hiking out, and a special place for me in hell. Nevertheless, he quickly recovered, both physically and emotionally and down the river we went. Within few hundred yards we started seeing people along the shore who informed us that the bridge was less than a mile downstream. That last mile turned out to be an easy paddle to the take-out. We took out on the river right, kicked back on a sunny green field and concluded that this was a classic run definitely worth doing again. An hour later we reaffirmed this conclusion while planning our next trip over couple of beers at a Nevada City pub. For shuttle directions, see the Holbek/Stanley book, 2nd or 3rd edition.